Lindy Hop and Swing Dance Classes are currently ongoing. The current series of classes run from January 14, 2018 - March 4, 2018. Now our experienced members can learn new moves in the 1pm Intermediate Swing Dance class. Then all levels are welcome to go over the basics in our Intro class at 2pm. This will be followed by social dance practice time. As always, classes are free and no partner is necessary. Bring indoor dance shoes or just dance in your socks. All are welcome (from OIST or the local community)! Contact oister.swing [at] gmail.com for more information. Back by popular demand...Nammy & Shinji are returning to Okinawa from Sendai to teach another beginners balboa dance workshop in the OIST Village Center Meeting Room. Come give balboa a try! Balboa is a great swing dance variation characterized by small steps that's also great for dancing to fast music. See Events tab for more information. Swing Party Event featuring the Ryukyu University's Modern Jazz Orchestra (MOJO) Feb 8 @ 6pm. 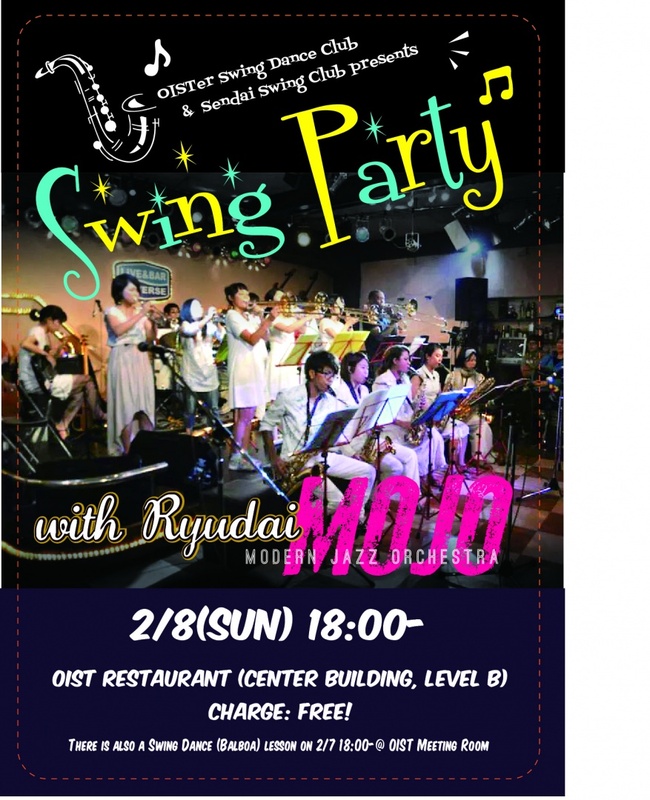 We're throwing a Swing Party in the OIST Restaurant (Center Building, Level B). The party will feature the music of Ryudai's MOJO band! Come join us to dance to the live music, or just come to listen to some swingin' tunes! All are welcome and the event is FREE. This event is co-sponsored by our friends, the Sendai Swing Club. The “OISTer Swing Club” has triple-stepped its way on to campus! With the recent discovery of hidden swing dancers amongst us and the local community, a new club has been formed to promote this fun and social dance. The club aims to spread the love of swing to novices and to organize opportunities for dancers to get together. Swing Dancing is a form of social, partner dance that grew out of Jazz and Big Band music in the United States. Swing Dancing was widely popular in the 1920s-50s and has resurfaced again, spreading all over the world. Today, welcoming communities of swing dancers exist in most major cities and we hope to bring this tradition to Onna-son! Swing dance includes variations like Lindy Hop, East Coast Swing, Jitterbug, and Charleston. For a sense of fast, modern swing dancing looks like, check out: http://www.youtube.com/watch?v=myJj0mNNe1Y&list=RD02qkthxBsIeGQ. If you would like to be a member (to get regular updates about club events; and to help us stay organized! ), please sign up on the Membership Application tab on the left. Membership is free and open to everyone - OISTers, residents of Okinawa, as well as visitors. Even as a non-mmeber, please feel free to drop by to any of our events, and dance with us! See 'Calendar' & 'Events' tab or email oister.swing [at] gmail.com for more info.